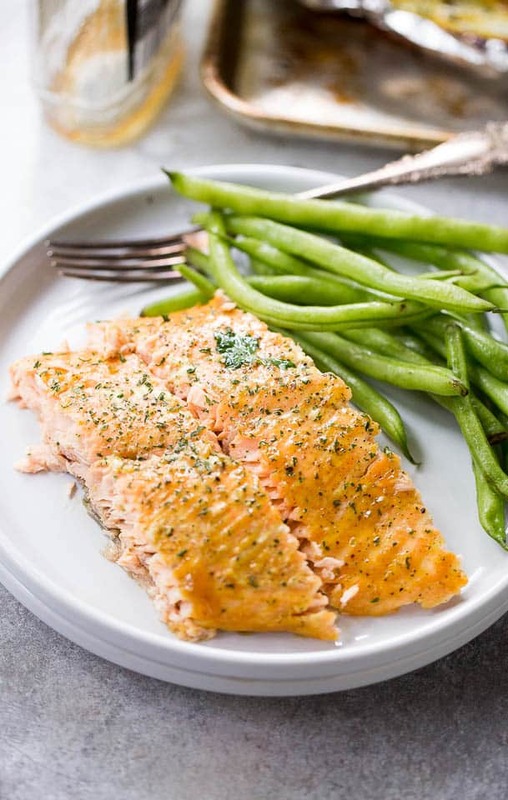 Maple Mustard Salmon in Foil – Delicious, sweet and tangy salmon coated with an amazing maple syrup and mustard sauce, and baked in tin foil to a flaky perfection! Give me anything baked in tin foil or parchment paper, and I am totally A-OK! Hi ya!! Wassup?? How are we all doin’? It’s the first week of absolutely NO school, and while I’m completely lovin’ this no alarm clock wake up call, the screaming little girls at 6 a.m. wake up call is waaaaay worse! You guuuuys, omg! WHO KNEW! And WHY are they up that early?! What have they got to do that early in the day except for spinning their fidget spinners and asking me for evvvvery breakfast item known to (wo)man and end up eating a bowl of cereal, instead. Yes, while the hot homemade pancakes are sitting next to them!! BUT, for the reason that I’m completely spent by 5 pm, dinners are made in foil or parchment paper because I am sooooo over and done. Cleaning up is a breeze and everyone, including me, is satisfied. 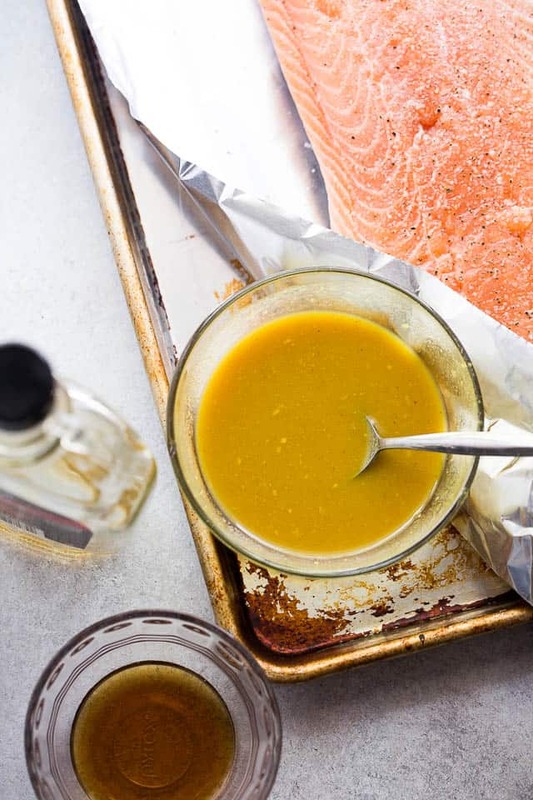 Look at that golden flaky maple mustard salmon deal up there? How could I NOT be satisfied? Mustard and Maple Syrup sitting in a tree, discussing how to make it to my tumm-Y! Following the same method as I did here in my One Pan Maple Mustard Chicken and Potatoes (YUM! ), the sauce is prepared with a couple of mustards + maple syrup that result in one suhweeeet mess! I, then, pour it over a beautiful and fresh whole salmon fillet, seal it up, and pop it in the oven. Seriously, this takes all of 3 minutes. To add a crispier texture, I also like to put this Maple Mustard Salmon under the broiler for a few minutes after it’s done cooking. IT makes a delicious difference. Before you know it, dinner is done! In the meantime, I’d suggest making some green beans – try my Roasted Green Beans, pleeeease! – and a nice helping of brown rice. You won’t believe how good all this goes together! AND it’s healthy! 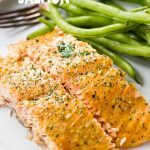 Maple Mustard Salmon in Foil - Delicious, sweet and tangy salmon coated with an amazing maple syrup and mustard sauce, and baked in tin foil to a flaky perfection! 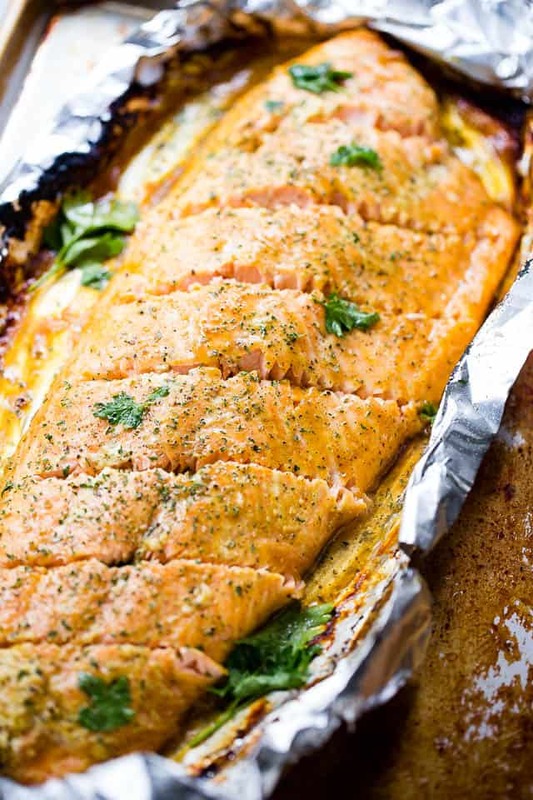 Set the salmon fillet over the foil and set aside. 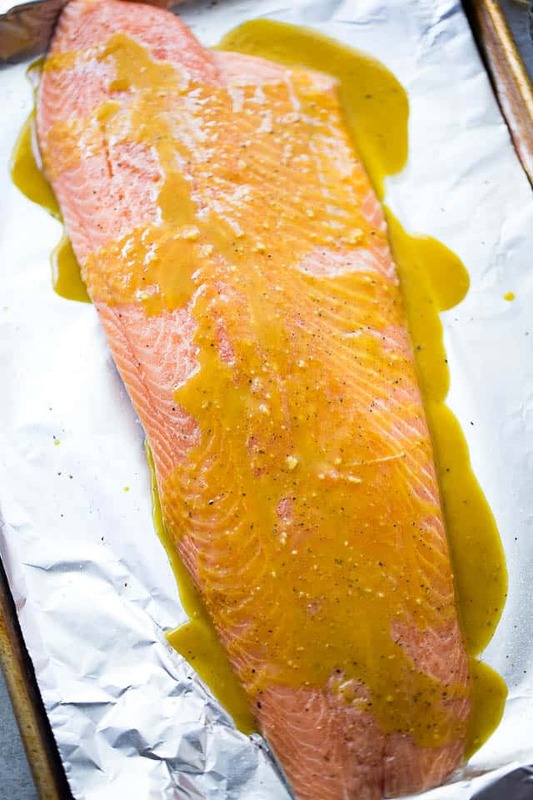 Pour the maple mustard mixture over the salmon and using a pastry brush spread the sauce evenly over the salmon. 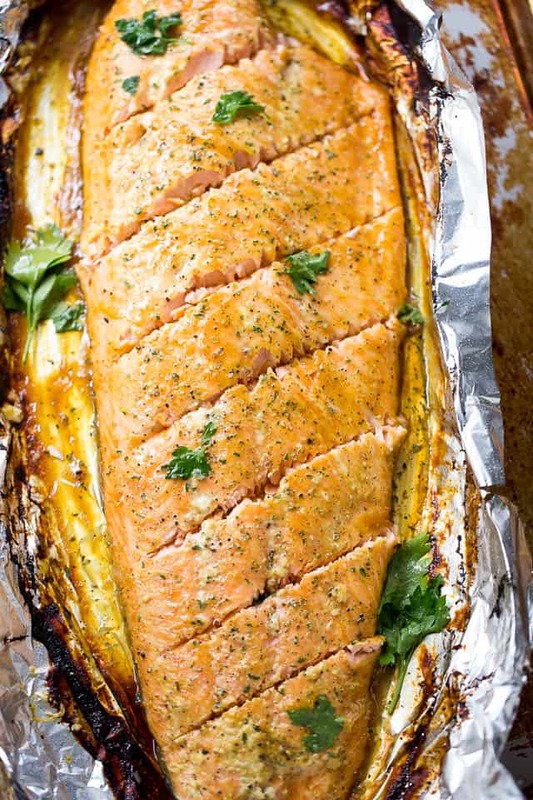 Fold the sides of the foil over the salmon to cover and completely seal the packet closed so the sauce does not leak out. 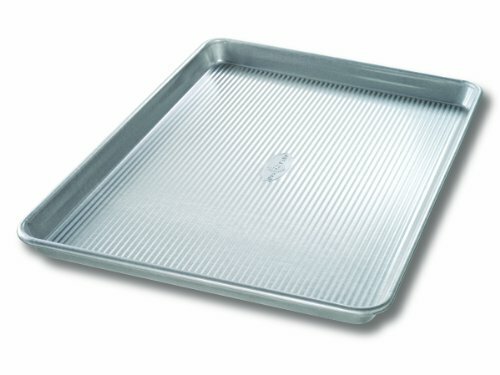 Bake for 20 to 22 minutes, or until cooked through. Cooking time will depend on the thickness of the salmon. Remove from oven and carefully open up the packet. Put it under the broiler for 3 minutes, or until golden. *If you are on a diet to lose weight, I would suggest eating 4 ounces instead of the whole serving size, which is 8 ounces. Looks delicious~ Do you know how many WW freestyle points this is? Do you know how many WW freestyle points this is? Great quick, easy and delicious recipe! We used real maple syrup, added some Stone Ground Mustard as well as a bit of grated garlic cloves. a dash of hot sauce and low sodium soy sauce. Finished as directed but added a dash of lemon. Made this for dinner with friends last night. Absolutely delicious and so easy! Everyone loved it. 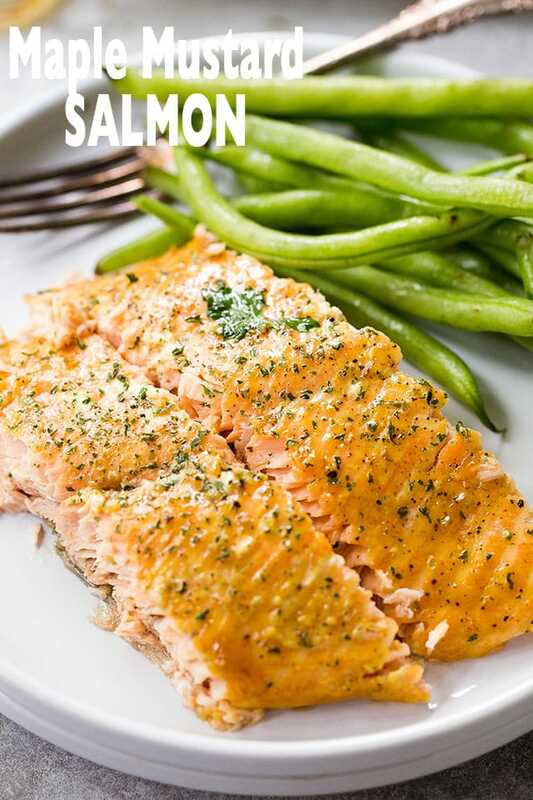 This is a gorgeous salmon recipe. I need to try that sauce. I would use sugar free syrup instead of maple syrup just because I am diabetic and it would also cut the calories quite a bit. I can’t give a rating because I haven’t tried it yet. Yummmmmm. This looks so satisfying and delicious. And my household sounds similar to yours these days. 😉 Those early wakeup calls for no apparent reason are super awesome in the summer, haha. Mustard and salmon and go so well together. I really love the idea of the foil packet! This is going on the list ASAP! Love the tanginess of the mustard with this…and the minimal clean up! This is such a great idea! Less of a mess to clean up! That looks positively swoon-worthy, YUM!